SPRINGFIELD – Summer Robbins of Coffeen will serve as the Illinois State Fair queen after winning the title of Illinois County Fair Queen in January. The University of Illinois sophomore already spent much of the year on a 3,500-mile tour of the state, visiting county fairs from as far north as McHenry County near the Illinois-Wisconsin state line to Union County, south of Carbondale. 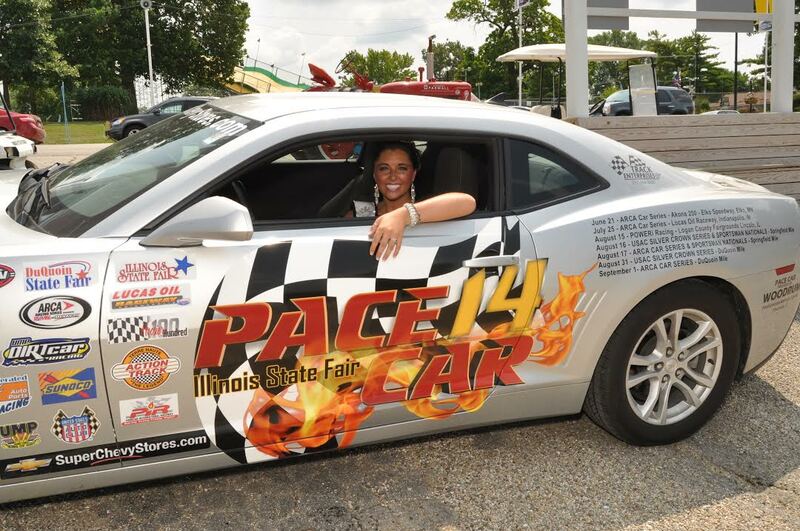 Robbins also spent time in the 2014 Chevrolet Camaro, Illinois State Fair pace car prior to this year’s fair, when Track Enterprises again promotes the races. On Aug. 16, the Tony Bettenhausen 100 is a 100-lap feature for USAC Silver Crown cars. The Sportsman Nationals also run heat races. USAC qualifying begins at 10:25 a.m. with the feature at 2 p.m.
On Aug. 17, the Central Illinois SuperChevyStores.com 100 is a 100-lapper and the first race on dirt this season for the ARCA Racing Series presented by Menards. The Sportsman Nationals also run the feature race. For tickets, call 217-764-3200. For more information, check online at Trackenterprises.com and Maconracing.com.